The ROHO® AirLITE® Cushion combines the benefits of a sealed air support pad and a durable contoured foam to provide postural support and optimal durability. 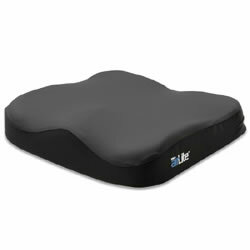 The non-adjustable pre-set air support pad, uses patented ROHO AIR FLOATATION Technology, while a contoured high density foam base positions the body in a comfortable position. Includes: AirLITE cushion, operations manual and cover. Cover: Fluid resistant polyurethane film laminated to two-way stretch Polyester knit top, nylon sides, and vinyl coated polyester knit non-skid bottom. Machine washable. Weight Limit: 275lbs. when properly sized to the individual. Comfort. By combining a contoured, anatomical-shaped foam with a pre-set, sealed AIR FLOATATION component, the AirLITE® enables users to sit comfortably for an extended time. AirLITE's technology and design provides the comfort you want and the support you need. Durability. Foam wears out. Most foam cushions will compress over time. The AirLITE cushion's pre-set, sealed AIR FLOATATION component provides comfort and peace of mind you can count on long after other “just foam” cushions have lost their effectiveness. Contoured Foam Base for stability and ease of transfer. Provides reactive distribution of load across the entire contact area. Lightweight: Adds minimal weight to entire mobility system, increasing mobility and function. The breathable, fluid-resistant cover protects the cushion from fluids, odor and machine washable. The non-skid bottom of the AirLITE's cover increases security of the cushion not moving in the wheelchair. Have full tactile sensation and who are low risk for pressure ulcers. For clients who are at high risk or have existing pressure ulcers, consult with a clinician. Please Note: ROHO, Inc. recommends that a clinician such as a doctor or therapist experienced in seating and positioning be consulted to determine if the AirLITE® Cushion is appropriate for the individual’s particular seating needs.